Upon returning home, I went to my gym and immediately signed up with a personal trainer. I was to see Bryan weekly and work out on my own 2 other times each week. My training guide from the first session in May 2016 describes a brief warm-up and included: box squats, which were difficult; seated shoulder presses holding a 6 lb. ball; side raises, dumbbell curls, front step-ups with dumbbell front raises—all with 2.5 lb. dumbbells. Bryan and the other trainers have been encouraging and patient. They understand I have to listen to my body and go slowly. The results? Now, almost 3 years later, I can see and feel my quadricep muscles, but even more importantly, I just feel energized, walk more smoothly, have a stronger core, and experience much less pain. I can kneel down on one knee and get up again without holding on, which I couldn’t do before. I go to the gym 3 times a week for 1 hour and see Bryan twice monthly. My workout varies, including body weight exercises (planks, bridges, wall sits) and various machines and weights. I like using glider discs to do various exercises such as mountain climbers. To avoid injury, I advance slowly and back off if anything hurts. 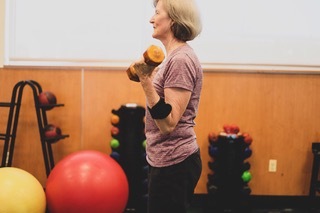 The physical benefits of strength training are many, including stronger bones, improved quality of life, and help with managing weight, osteoporosis, arthritis and many other chronic diseases. Next year, when I get my bone density scan, I’ll find out if my osteoporosis is improving…I’m betting yes. Exercise helps the mind as well as the body. It improves attitude, lessens depression, and enhances self-efficacy. If a magic pill was available that could do all this, you’d probably pay good money for it! 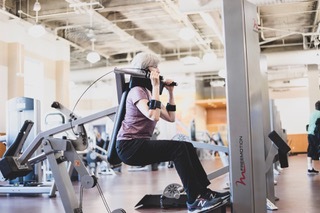 One more thing, strength training for seniors greatly reduces the risk of falling. Three of my friends in the neighborhood have fallen in the last 6 months. Check out the photos below of Bryan and me at the gym. Check out the Institute of Lifestyle Medicine or follow them on Facebook or Twitter. If you are a healthcare provider of any type, consider attending this yearly conference. You might be interested in the free 21-day exercise challenge called the Magic Pill. A great book about exercise is Younger Next Year. See Resources for information on this book and other references. Or, read about a great exercise program in my neighborhood called Fit for Christ or follow them on Facebook. If you haven’t heard about the terrific international program called Park Run, check it out. In most areas, you can find a group that meets every Saturday morning for a 5K timed walk or run, both which are great weight-bearing exercises. A group meets in College Park, MD, very near to my home. So, how do you want to start? As you can see from my list of exercises, many of these require no equipment. If all you have is 10 minutes a day to walk or run or exercise on your living room rug, that is how you should start. There are many online materials to help you get started. Just google “strength training programs free.” Write down the one step you will commit to today—then just start. This is the critical first step. P.S. Remember that now for the first time my blogs are open for comment. I would love to hear from you. Have you taken your first hard step? Share your experience here or on Facebook or Twitter. Thanks to Bryan Rodriguez, my trainer at LA Fitness, for assisting with these photos. Older PostIs Your Bad Day a Blessing in Disguise?